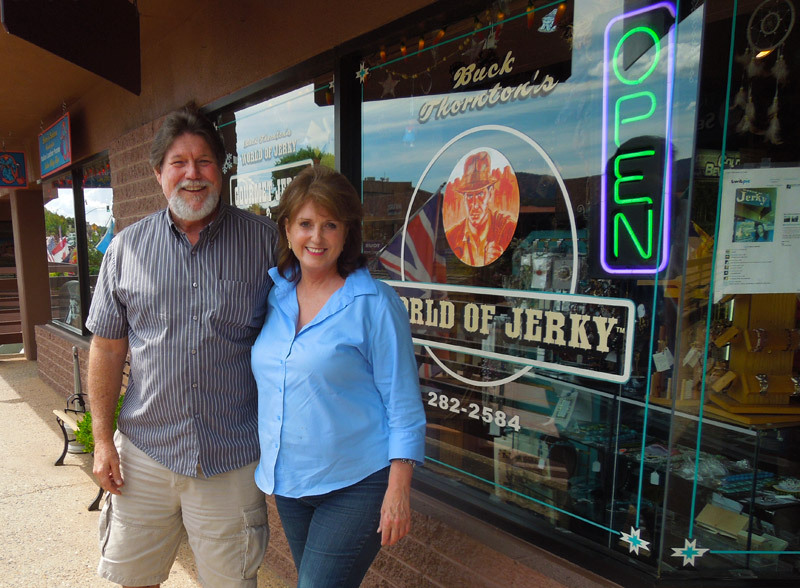 THE COWBOY and the BEAUTY QUEEN: In 2003 Buck and Kitty (AKA Gary and Sheri) opened Buck Thornton’s World of Jerky in Sedona, Arizona after falling in love with the town and being tourists there themselves for many years. Buck, “The Cowboy” an outdoorsman began making Jerky as a kid growing up in the Sierras in California. He began making jerky to take along with him on hikes and camping trips. Jerky was his preferred choice over instant oatmeal – NOT Buck’s favorite! Kitty, more a City Girl is the former “Beauty Queen” part of the duo, having been selected as one of seven girls out of over 66,000 nationwide to participate in the “1968 Miss Teenage America” Pageant. Later, in 1970 she won the title “Miss Nevada Universe” where she was also selected as Second Runner-Up to “Miss USA ” that year. Kitty knew nothing about Jerky when she first met Buck on the 91 Freeway in California 1986. So, Buck introduced her to “The World of Jerky” and all its goodness. Today, The World of Jerky truly is a world of many Jerkies offering Buck’s Award-Winning Beef Jerky to the Game Jerkies that they first started out with, to the much more Exotic Jerkies they now offer along with other tasty food treats. Kitty and Buck invite you to visit their store when in Sedona located in Uptown in the Matterhorn Shoppes to sample all their many styles and flavors of Jerkies. Of course, if you can’t make it in, you can always do this, and order online.